As with most things around the house, stoves need a little bit of tender loving care in order to serve you well throughout its life and like any machine your stove needs to have a regular check over. The above mentioned are the main parts, that can have an effect on the way the stove works. It is recommended that you check the above items regularly. This will ensure that your stove looks after you through out the cold winter months, year after year. Although efficient to run, they have some underlying problems from a chimney and flue function point of view, for which we have produced this list of steps for dealing with Cleaning and maintenance issues. If it is a multi fuel stove, we will check that the grate is in good condition and that it riddles easily. If the grate is cracked or distorted – too much distortion and it can jam the riddling mechanism or jam in the stove. Check the fire bricks if it has them. If a brick is damaged or cracked so that a piece could fall out. A missing piece of brick can cause a cast iron stove to crack or a steel stove to distort. Check the stove’s ash pan for holes. Hot ash leaking from an ash pan burns carpets. Check the fire rope seals around the doors and glass of the stove. Replace badly frayed or missing fire rope. A good way to check the door seal is by closing the door over a thin piece of paper – it should be difficult to pull the paper out again. On a cast iron stove, we will check the seals between the side and top plates. If there are gaps reseal with fire cement. Check the finish on the stove. Particularly on a cast iron stove, excessive rusting can cause problems. Rub down with a wire brush or steel wool and re-spray with heat resistant paint or re-polish with black grate polish. Cost of for above service in 25 miles radius distance from our showroom is £60.00 + cost of the parts. We offer FREE surveys on all our work and will be happy to make a visit any time suitable for you. 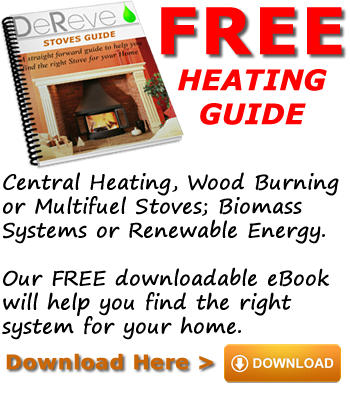 Installation of a stove is governed by building regulations Approved Document J. If you were to install the stove yourself, not only would you have to read and dissect this document, but you would also have to make sure you follow it to a tee and then notify building control on a building notice. Unless you have previous experience as a builder, fireplace installer or gas fitter we would not recommend installing your stove yourself. However, if you still would like to proceed with the self-installing your stove you can liaise with our HETAS registered engineer who can advise, supervise and who will certificate the installation once it will be carry on and completed accordingly with the Building Regulations requirements. Whichever route you take will not make any difference, legally.